It will not be long before the world realizes that something quite extraordinary is taking place. Already, signs are appearing that many people are becoming aware of a new atmosphere, a new turn of thought, difficult to place or describe, which gives them hope and alleviates the stress of the recent past. Something, intangible but strongly present, is making itself felt on a wide scale. Those who know, of course, of the presence of Maitreya and His Group, have for long experienced this feeling of comfort and quiet joy, this confident assurance that all will be well, no matter the circumstances of the day. In growing numbers, now, this sense of security and ultimate good amid the chaos and challenges of the present, is strengthening. Slowly and surely, people are awakening to the presence of they know not what, but dimly sense that it is for the good and safety of all. Thus does the Great Lord ease the pain of the present conditions and prepare the multitudes to respond to His words. Thus does He ensure their understanding of the priorities of the complex international situation which threatens the well-being of all. Many will be amazed by their unusual calm and objectivity in conditions of stress. Many more will wonder at their ready tolerance of long-standing opponents and rivals. Thus the Great Lord works to mitigate the suffering of so many. In time, men will associate their new-found ease with the One Who speaks so simply of trust, of sharing and peace. They will recognize that the simplicity belies a profound understanding of the human condition and the needs of all. So encouraged, they will follow His advocacy and raise their voices in response. Thus will the Voice of the People grow in strength and purpose and, echoing round the world, will call loudly to the leaders for sanity, justice and peace. Then will the men of power begin to realize that their day is over, that the people understand and demand their God-given right to health and happiness, freedom and justice, trust and blessed peace. Thus will it be, and thus will the peoples of Earth call for the Great Lord to speak directly to all, to cement their growing unity, and to indicate the steps to transformation of the world. Then will Maitreya reveal His true identity and nature. The Day of Declaration will be for humanity a new beginning, and will inspire from men, as never before, the best that is in them. Q. What is your opinion on the Hutton Report? Do you think it was fair? A. My opinion is that it is a travesty of justice � neither fair nor even complete. So tight was the remit placed on the work of Lord Hutton that no question of real import, especially in connection with the war in Iraq, and what led up to it, could be discussed. The choice of Lord Hutton as the investigative judge in the enquiry was made by Tony Blair and the tight remit given to him ensured inevitably an exoneration of Mr Blair�s actions, and at the same time a denigration of the British Broadcasting Corporation. It was, in a word, a total whitewash. Q. Was the recent mailing of the poison ricin to the United States Senate Majority Leader a result of domestic terrorists, international terrorists, or a staged manipulation by elements of the US Government to gain support and sympathy for the current administration? Q. What has happened to the British space probe Beagle 2 which was supposed to land on Mars on Christmas Day 2003? Did it crash, or is it lying in a crater where its transmissions have not been picked up? Q. Regarding the two spacecraft recently sent to Mars by NASA: (1) Are Earth�s scientist�s who are involved with the Mars project receiving any help from �higher� scientists such as those on Mars? (2) Will they make any surprising or significant discoveries? (3) Was there ever a dense-physical life on Mars? If so, how long ago? A. (1) No. (2) Yes. (3) Three million years ago. Q. (1) Can life in the higher etheric matter be detected by sound through conventional instruments? (2) Is the ability to hear the sounds of energies considered �etheric hearing�? (3) Do other kingdoms in nature, such as animals and plants, exist in the higher etheric matter on other planets, such as Mars? A. (1) Yes. (2) No. (3) Yes. Q. (1) Are the names of the planets in our solar system, as we know them, the actual names or are they just what humanity calls them? (2) Does the Logos of a particular planet give the planet its name? A. (1) What we call them. (2) No. Q. Can you say what is the real cause of �Gulf War syndrome�? A. There are several causes, each suggested by those seeking compensation for the veterans of the war who are still suffering the effects of the �syndrome�: depleted uranium fallout from munitions used by the Allied troops themselves; multiple vaccinations given before the war; tablets given to guard against possible nerve agents; chemical weapons destroyed by the Allied soldiers after the conflict. Q. Does saying the sound �OM� inwardly automatically bring the attention to the ajna centre or does one have to, in addition, make a conscious effort to place the attention there? Dear Editor, On 19 January 2004 my husband purchased some apples at the supermarket. He made sure they were perfect, and took particular care to avoid choosing any of the bruised apples in the box. 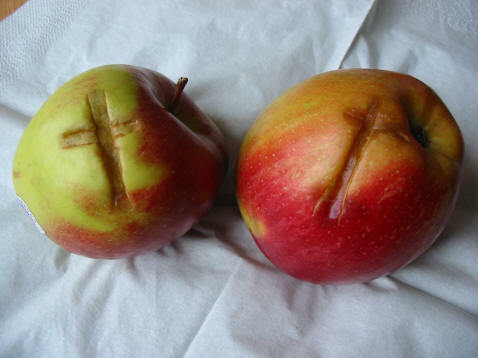 The following day, on taking an apple from my fruit bowl, I noticed what appeared to be the sign of the Christian Cross on the apple. I looked at the other apple in the fruit bowl and it too had a sign of a cross, but slightly different. The marks on both apples were deeply indented. You could imagine my surprise and delight � am I right in believing these to be signs? Dear Editor, On Sunday 23 November 2003, while at Transmission Meditation, I opened my eyes briefly. I noticed that the picture of �Maitreya�s hand�, on top of the television cabinet in the room where we meditate, had turned into what looked like the image of Maitreya�s face on the right-hand side of the picture. It reminded me of one of those optical illusion images that change when the brain �sees� it in a different way. Even though the lighting in the room was dim and I was about 15 feet from the picture, the hand looked as though its various components had been reconfigured to make His face. I opened and closed my eyes several times to check, but I always saw His face, and at one point could no longer see His hand. Was it my imagination or something more? Dear Editor, On Christmas Day 2003 my husband, sister and I were in the lounge of our home after returning from having lunch out. My daughter and the grandchildren had gone to the Middle East to visit her husband�s family. My sister commented that it wasn�t like Christmas Day and I said I felt the atmosphere was very flat. At that point a teenager on a bike wearing a brilliant white hat passed across the front window. My husband went outside to see who it was but there was no one there. We wondered whether we had been visited by a Master. After the incident the atmosphere was lifted and the rest of Christmas Day and Boxing Day seemed much better. Dear Editor, In 1999 I visited New York with a friend on a long weekend. On the last day, we found ourselves at the Metropolitan Museum of Art. There was an exhibit of Tibetan thankas, tapestries. There were Maitreya Buddhas, other Buddhas and the Green Tara. I was so impressed, they were the real thing. The gift shop had the Green Tara in poster form for sale, so I bought one. My friend wanted to stay in the gift shop longer, I said I would meet her out front on the big steps. I went out front and sat down. Nearby there was a young black man reciting a poem to a group of three or four people. He was very animated. At the end of his poetry reading people tried to give him money for the entertainment. He said: �I don�t want money, I do it for love.� He then said: �Give me some Love� and did a �high five� (hand gesture) to each one who listened. Then he went out of his way and came over to where I was and said: �Give me some love.� We did a �high-five�. He then ran down those long steps. At the bottom he turned around, pointed to me and almost yelled: �I know you, your future is so bright you�ll have to wear sunglasses.� He then turned and ran off. Can you please tell me who that man was? EO, San Antonio, Texas, USA.